ESO turns fifty this year, and to celebrate this important anniversary, we are showing you glimpses into its history. Once a month during 2012, a special Then and Now Picture of the Week shows how things have changed over the decades at the La Silla and Paranal observatory sites, the ESO offices in Santiago de Chile, and the Headquarters in Garching bei München, Germany. These two photographs were taken on the highest peak of La Silla, a mountain with an altitude of 2400 metres, at the edge of the Chilean Atacama Desert. La Silla was ESO’s first observatory site. 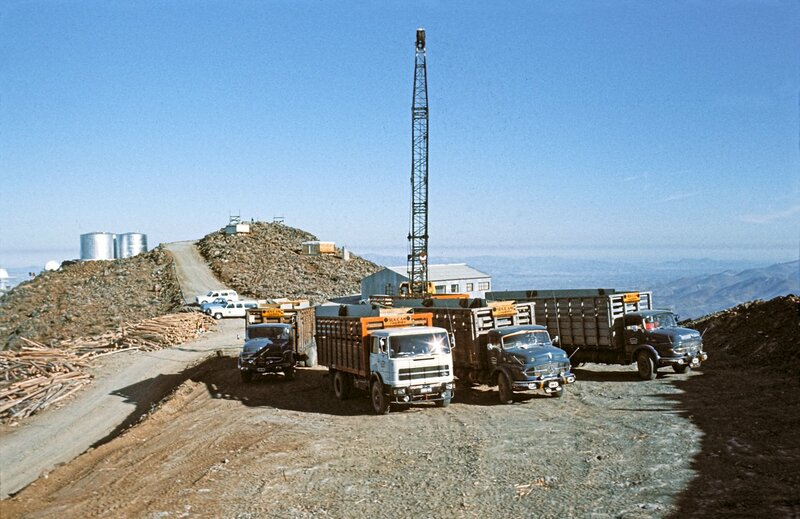 The historical photograph, taken in 1975, shows some of the trucks and other equipment used for the construction of the dome of the ESO 3.6-metre telescope, which was underway behind the photographer. On the left are the water tanks for the site. In the modern-day photograph, three new telescopes have appeared, all looking very different from each other. To the right of the water tanks is the ESO New Technology Telescope (NTT), which had its first light on 23 March 1989. This 3.58-metre telescope was the first ever to have a computer-controlled main mirror, which could adjust its shape during observations to optimise image quality. The octagonal enclosure housing the NTT is another technological breakthrough, ventilated by a system of flaps that makes air flow smoothly across the mirror, reducing turbulence and leading to sharper images. To the right of the NTT is the Swiss 1.2-metre Leonhard Euler Telescope, which has a more traditional dome-shaped enclosure. It is operated by the Geneva Observatory at the Université de Genève in Switzerland, and had its first light on 12 April 1998. It is used to search for exoplanets in the southern sky; with its first discovery being a planet in orbit around the star Gliese 86 (see eso9855). The telescope also observes variable stars, gamma-ray bursts and active galactic nuclei. In the foreground on the right is a building nicknamed the sarcofago (sarcophagus). This houses the TAROT (Télescope à Action Rapide pour les Objets Transitoires, or Rapid Action Telescope for Transient Objects), which started work at La Silla on 15 September 2006. This fast moving, relatively tiny 25-centimetre robotic telescope reacts extremely quickly to alerts from satellites about gamma-ray bursts, to pinpoint the positions of these dramatic but fleeting events. Observing these cosmic explosions lets astronomers study the formation of black holes and the evolution of stars in the early Universe. TAROT is operated by a consortium led by Michel Boër from Observatoire de Haute Provence in France. 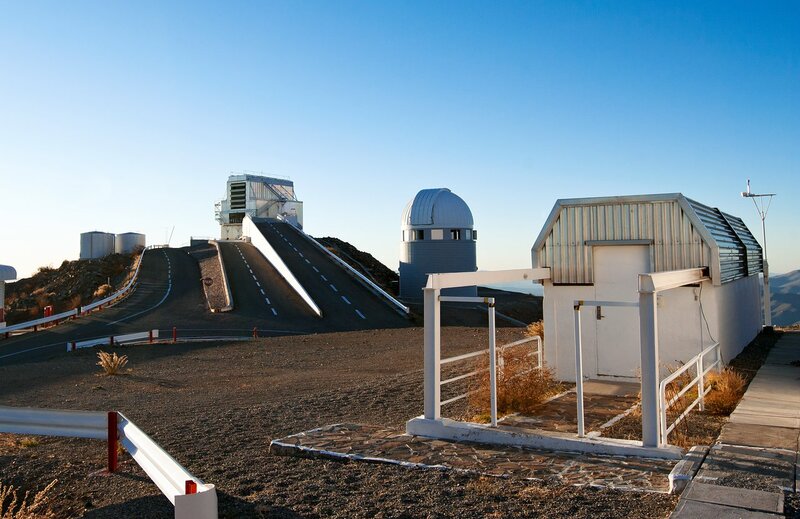 The NTT is operated by ESO, while the Leonhard Euler Telescope and TAROT are among the national and project telescopes hosted at La Silla. Even today, over 40 years after its inauguration, La Silla remains at the forefront of astronomy.